Life Explained EXPLORES HISTORY: The Empire of Khan. For approximately sixty years the armies of Genghis Khan tore through Asia, the Middle East, and Europe. An irresistible tidal wave of of horsemen, thundering down from the plains, engulfing the world. 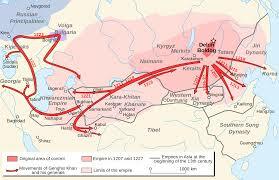 Before Genghis Khan the nomads were scattered, geographically and in purpose. But, when the Great Khan, leader of all those who "lived in felt tents" united them it was a monstrosity the world was not prepared for. The Mongol Empire stretched from the Pacific Coast of China all the way to the Adriatic. It encompassed an area the size of North America, and Central America, from Alaska past Mexico. It was the largest contiguous land empire the world has ever known. Their empire exceeded the Roman land empire by three times, and was even larger than Alexander's. Of course, the Alexandrian empire died pretty much with his passing and the Mongols kept expanding for at least one generation. But, imagine the possible reach, had one of Khan's grandchildren, or great grand children been able to keep the tribes united. For the most part, the European powers were almost casual about the threat posed by such a distant tribe. They were so busy preparing for the crusades they could not be bothered to mount a defense. Generals Subedei and Jebe went into what is now Georgia, on a reconnaissance mission and laid waste to the armies of the area, destroying them without mercy. Nobody thought that was a significant enough event to merit a unification. When the Mongols came back in force the armies of Russia, Poland and Hungary fell like dominoes. There are even rumors of Persian Emissaries traveling to the European powers and asking for assistance, that is how desperate the situation had become. It was the death of Ogedei Khan the third son of Genghis that prevented the empire from reaching the Atlantic. It was a fortunate occurrence for the Europeans. The Mongols were ruthless, but effective. Future posts will cover the rise of Genghis, the expansion of his power, and as much as possible the tactics, and success of his armies.